Ben continues his mind games with Locke. Jin and Sun discuss their plans once they get off the island, and Jack returns to the beach camp with Faraday and Charlotte. Kate wants to know why Miles knows so much about Kate, but he won't talk until he talks to Ben, so Kate busts him out and takes him to Ben, where he demands $3.2 million to keep Ben's existence on the island a secret. 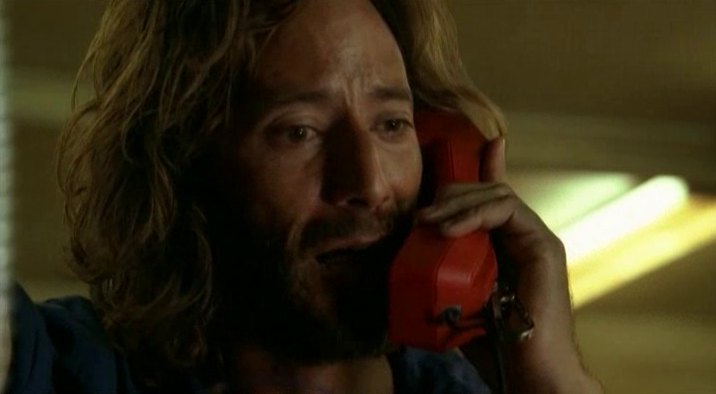 When Locke finds out, he orders Kate out of the camp. The beach camp is having trouble getting in touch with the freighter, and when they finally get in touch with them to find out where Sayid and Desmond are, they discover the helicopter hasn't arrived on the freighter yet. We cut to the helicopter heading towards the freighter, when suddenly they hit some kind of interference. When they get through the interference, they see the freighter, but suddenly Desmond doesn't know where he is. Quick side note: This was kind of an awkward sequence to place, given the weird time distortions between the freighter and the island. The scene we saw on the helicopter, might have taken place at a different time than when I put it in relation to what was going on at the island. I guess the moment of separation might have been when Desmond suddenly started losing his memory. I dunno, it's not a totally clear situation, so I tried to just leave it the way that it was as much as possible. The helicopter lands on the freighter, and Desmond doesn't know where he is, who he is, and begins to experience memory flashes between the present and 1996. He is taken down to the freighter's sickbay to be looked at by the doctor. Sayid calls the island, and Daniel learns of Desmond's time flashes, and tries to help him find his way. He tells Desmond to find himself at Oxford in 1996. He learns that he needs to find a constant, in both 1996 and the present, to help his mind drift back to the present so that he doesn't die. He heads up to the communications room, and is able to call Penny, his Constant, and his mind is restored to the present. The episode runs 49:17 and is 398MB to download. You can stream the episode below (via Facebook), or go here to use torrents (better quality, recommended) to download the episodes to your computer. WOW...it was very odd to watch the events of The Constant like that! I thoroughly enjoyed it. I LOVE this project. I'm especially excited to watch the off-island happenings of the Oceanic 6 + Ben, Locke and Desmond, since the timeline for that is particularly difficult to remember. I agree, the period of 2005-2007 was a segment of time that was presented to us all out of order, so I think it's one of the areas of the show that benefited most from being put into chronological order. Have you had any issues because of the time dilation stuff?